Richard Widmark burst upon the Hollywood scene in the late 1940s in a series of noir films at the Fox studio. An intense, yet oddly loose manner allowed him to play well in action films, including many roles where he played characters of authority. Born to an English / Scottish mother and a Swedish traveling salesman father, Mark grew up in several towns in Illinios, then attended Lake Forest Collage, where he studied acting and taught the art there after graduating. Moving to New York, Widmark made his debut in 1938 as a supporting character on the 15-minute long daily radio soap opera Aunt Jenny's Real Life Stories (1837-1956), broadcast over CBS. Before long, Widmark had his own show, Front Page Farrel, over the Mutual Network, where he played "a crack newspaperman." Widmark appeared on many other radio programs during the early 1940s, turned down for military service due to a perforated eardrum. Widmark made his Broadway debut in 1943, in the cast of Kiss and Tell. He was in Chicago, appearing in a stage play called Dream Girl, when he was signed to a seven-year contract at 20th Century-Fox. Widmark was cast as the heavy in the noir film Kiss of Death (which played the Chinese in August, 1948), and became typecast for his sadistically pushing a wheelchair-bound Mildred Dunnock down a flight of stairs. Such a success was followed by being third-billed behind Gregory Peck and Anne Baxter in Yellow Sky (played the Chinese in January, 1949 — although Widmark would beat both of them to the Forecourt by seven months). Widmark was headlining in the picture playing during the Forecort ceremony, Down to the Sea in Ships with Lionel Barrymore. Talent Quest contest winner Charles Nelson was imprinted on the same evening ceremony. Don't Bother to Knock with Marilyn Monroe (released in August, 1952), Pickup on South Street (released in May, 1953), Garden of Evil with Gary Cooper (released in June, 1954), and Broken Lance with Spencer Tracy (which played the Chinese in July, 1954); this was the last film under his Fox contract. Now a free agent, Widmark headlined in The Cobweb with Lauren Bacall (released in June, 1955). During this time, Widmark and his wife Jean Hazlewood began a large cattle ranch in Missouri. In the 1960s, Widmark fit into the pattern of all-star productions, where he usually played authority figures: starting out with playing Colonel Jim Bowie in The Alamo (released in October, 1960), a U.S. prosecuting Colonel in Judgement at Nuremberg (released in December, 1961), a ruthless railroad man in How the West Was Won (released in February, 1963), and an Army Captain in Cheyenne Autumn (released in October, 1964). Widmark played the lead in the police detective drama Madigan (released in March, 1968), which later became a television mini-series, over NBC in 1972-1973. Widmark starred as the U.S. President in the TV movie Vanished! in 1971, played a mysterious importer who ends up dead in Murder on the Orient Express (released in November, 1974), the evil head of a hospital in Coma (released in January, 1978), and an Army General combatting The Swarm (released in July, 1978). 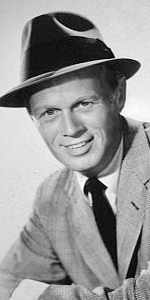 Widmark returned to his love of radio by performing on the CBS Radio Mystery Theatre (1974-1982), and was a host on Sears Radio Theatre over CBS from 1979 to 1981. Winding down, Widmark played an NFL team owner in Against All Odds (released in March, 1984), and he played a U.S. Senator in his final film, True Colors (released in March, 1991). He went on record to state that filmmaking had lost its magic; that directors were more interested in the camera than they were in the actors. A fair assessment from the actor's point of view. Widmark from acting, then suffered a fall in 2007. He slid into a long illness. Widmark died in 2008, at the age of 93. Grauman's Chinese Theatre, Hollywood, California. Richard Widmark Forecourt ceremony, Sunday, April 24, 1949. 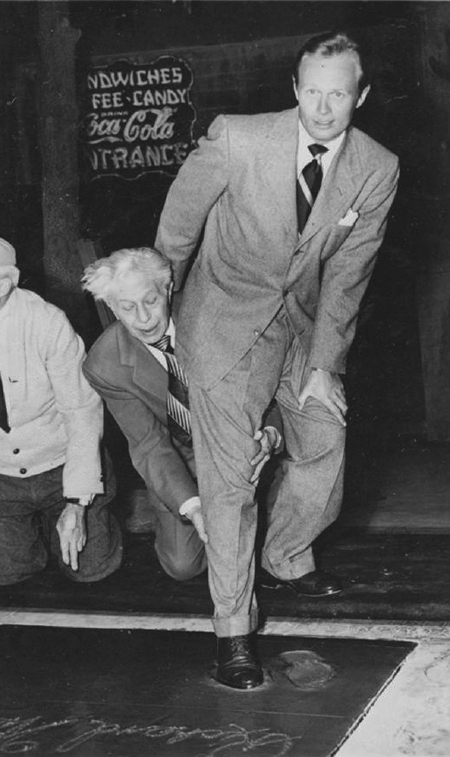 Sid Grauman helps steady Richard Widmark as he makes his footprint. Cement artist Jean Klossner is cropped out of the shot on the left.